This live performance was filmed in front of a sold-out crowd of more than 18, 000 fans on March 17, 2018 at the Ziggo Dome in Amsterdam. This live concert footage, beautifully shot and edited see’s TOTO perform a wide range of songs, including hit singles, rarely performed album choices, and two recently recorded tracks which appeared on their new Greatest Hits album (40 Trips Around The Sun). Toto celebrate their 40th anniversary in blistering style here. Off course they play the hit singles, but Toto are a much bigger band than the million selling “Africa”, and I for one are grateful they pull out of the bag some lesser known tracks from their albums for this tour. 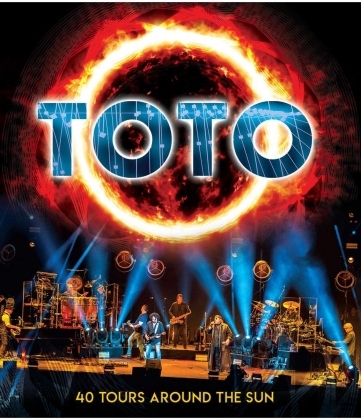 What is great about this dvd is the fact it was recorded in one take, on one night, no taking the best bits from the tour and gluing them together, nope, one show, one take, but would you expect anything less from the musicians Toto currently have? I guess not. Steve Lukather, as expected is magnificent, leading from the front but quite happy to let others shine when it’s there moment, and there are plenty on this, Shannon Forrest has grown into his drum seat since I saw them when they toured “XIV”. Joseph Williams really does make these songs his own, but he really does excel on “Lion”, the old guard, Lenny and Warren are back where they belong, with the magnificent Shem on Bass and Vocals. Utterly fantastic. The dvd sound is punchy and well balanced, with the acoustic section being particular open. I have seen bigger bands with smaller light shows, sure Toto do not really need all those lights and stage settings, but it is great that they use them, after all we are there for a show. I cannot recommend this dvd highly enough, it is a masterclass in musicianship while at the same time involving the audience just enough to keep them begging, and shouting, for more.